Indication For the treatment of active hairy cell leukemia (leukemic reticuloendotheliosis) as defined by clinically significant anemia, neutropenia, thrombocytopenia, or disease-related symptoms. Also used as an alternative agent for the treatment of chronic lymphocytic leukemia (CLL), low-grade non-Hodgkin's lymphoma, and cutaneous T-cell lymphoma. Pharmacology Cladribine is a synthetic purine nucleoside that acts as an antineoplastic agent with immunosuppressive effects. Cladribine differs structurally from deoxyadenosine only by the presence of a chlorine atom at position 2 of the purine ring, which results in resistance to enzymatic degradation by adenosine deaminase. Due to this resistance, cladribine exhibits a more prolonged cytotoxic effect than deoxyadenosine against resting and proliferating lymphocytes. Cladribine is one of a group of chemotherapy drugs known as the anti-metabolites. Anti-metabolites stop cells from making and repairing DNA, which are processes that are necessary for cancer cells to grow and multiply. 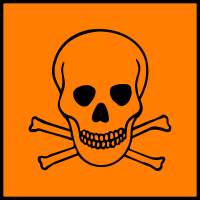 Toxicity Symptoms of overdose include irreversible neurologic toxicity (paraparesis/quadriparesis), acute nephrotoxicity, and severe bone marrow suppression resulting in neutropenia, anemia and thrombocytopenia. Absorption Oral bioavailability is 34 to 48%. Description Cladribine (Leustatin, Litak, 2CDA) is an adenosine deaminase inhibitor for U266, RPMI8226, and MM1.S cells with IC50 of approximately 2.43 μM, 0.75 μM, and 0.18 μM, respectively. Clinical Trials Cladribine plus Rituximab has entered in a phase II clinical trial in the treatment of leukemia. Features Cladribine is primarily active in lymphoid tissues. Methods The non-radioactive cell proliferation kit is used to determine cell viability. In brief, Human MM cell line U266, RPMI8226 and MM1.S are seeded onto 96-well plates with either 0.1 mL complete medium (5% FBS) as control, or 0.1 mL of the same medium containing a series of doses of cladribine, and incubated for 72 hours. After reading all wells at 490 nm with a micro-plate reader, the percentages of surviving cells from each group relative to controls, defined as 100% survival, are determined by reduction of MTS. Ma J, et al. BMC Cancer. 2011, 11, 255. Guchelaar HJ, et al. Cancer Chemother Pharmacol. 1998, 42(1), 77-83. Böhm A, et al. Exp Hematol. 2010, 38(9), 744-755. Kopadze T, et al. Eur J Neurol. 2009, 16(3), 409-412. Klein LC, et al. Biomarkers. 2009, 14(8), 554-559. Yeung PK, et al. Drug Metabol Drug Interact. 2008, 23(3-4), 291-298. Szmigielska-Kaplon A, et al. Ann Hematol. 2002, 81(9), 508-513. 2-Chloro-2′-deoxyadenosine (2-CdA) is a chlorinated purine nucleoside with activity against lymphoproliferative disorders, such as hairy cell leukemia (HCL) and multiple myeloma (MM). 2-CdA resists ADA degradation and is phosphorylated to CdATP in lymphocytes. CdATP incorporation into DNA induces strand breaks and the activation of apoptosis. 2-CdA may also be used in studies involving the inhibition of DNA polymerase(s).Cladribiane, like fludarabine, is a prodrug that is must be phosphorylated intracellularly to the monophosphate by the nuclear/cytosol enzyme deoxycytidine kinase (dCK) and possibly by the mitochondrial enzyme deoxyguanosine kinase (dGK). Cladribiane, like fludarabine, is a prodrug that is must be phosphorylated intracellularly to the monophosphate by the nuclear/cytosol enzyme deoxycytidine kinase (dCK) and possibly by the mitochondrial enzyme deoxyguanosine kinase (dGK). Clinically used for treatment of hairy cell leukemia, chronic lymphocytic leukemia and other indolent leukemias. • Ma J, et al. BMC Cancer. 2011, 11, 255. • Guchelaar HJ, et al. Cancer Chemother Pharmacol. 1998, 42(1), 77-83. • Böhm A, et al. Exp Hematol. 2010, 38(9), 744-755. • Kopadze T, et al. Eur J Neurol. 2009, 16(3), 409-412. • Klein LC, et al. Biomarkers. 2009, 14(8), 554-559. • Yeung PK, et al. Drug Metabol Drug Interact. 2008, 23(3-4), 291-298. • Szmigielska-Kaplon A, et al. Ann Hematol. 2002, 81(9), 508-513.